How to drown maggots : Goodbye London and fishing on Thursday - Maybe. 39 years and 19 days after moving into our Victorian terraced house (that we bought as a first time buy back in the days when nobody wanted to live here) we have just put it on the market. Since we moved here the area has steadily become more desirable as the infrastructure has been improved and the surrounding areas have become far too expensive for anybody but the elite. Now the multi-coloured, ten-year old Ford Cortinias and rusty Morris Marinas that used to adorn the curb have been replaced with Range Rovers, Porsches and Mercedes. Every road has houses being refurbished to high standards and usually with the addition of loft conversions, extensions and even basements excavated. Who would have thought, when we bought a house that had been converted into two flats, for no money at all, that four decades on it would be one of the most desirable locations in the road? Not us, that is for sure. Originally, we had only intended to stay here for three years. 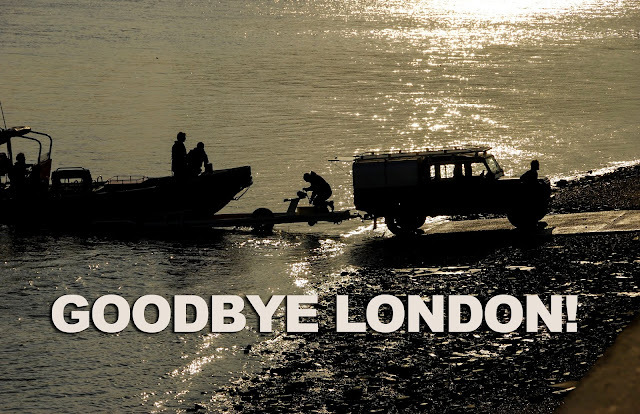 Now after a lifetime of living in the smoke it will be a big wrench to drag ourselves away from all the advantages living in London can offer. This has been made a lot easier in recent years by the growing list of disadvantages for us. There is no doubt that a younger person making his way in life, the modern fast, twenty-four hour vibe of the metropolis can be the perfect place to live. For me, all that is behind me. At 62 years of age, I have no intention of landing myself with a whole lot of stress I don't need. The thought of moving out to a place where I can just be, has become more and more appealing as the years chug by. Making the move now, before I get too old to enjoy the things I love, makes perfect sense. So What has this got to do with fishing? Lots. For a start I will not be able to do much fishing over the next few months while we pack up and sort out the best part of forty years of accumulated stuff. You know, there is furniture, clothes and kitchen utensils and all the rest is 'stuff'. We seem to have far more than our fair share of stuff, in fact I had no idea just how much stuff we actually had tucked away in this house! Fishing gear comes under the 'stuff' category and again, it mounts up. My intention is to keep some to hand, but the rest will have to be packed up ready to move and put into storage for a while, along with a lot of other stuff. Now I have to decide what to keep to hand. I could base it on what I take when going 'light'. See HERE. That covers float fishing, but I will add a couple of my short tele-poles and pole-rigs. I will also keep to hand my little telescopic rod that I use on the tiny rivers we have locally. That should do for the foreseeable future. All the rest will go into storage and will still be accessible if I do need it. ...Happy to be going fishing, but even happier now we have just had an offer accepted on a house we want to buy - all we have to do now is sell this one!